In my last blog I talked about making a tie fleece blanket and used Gene Anne’s from 2009 as an example, well here is another option for a fleece blanket! Gene Anne’s boyfriend, Spencer graduated from high school last month and back in April she told me she would like to make him a tie fleece blanket for a graduation gift. It is my understanding that this is a popular gift for the college bound kids if you are not a quilter. As many of you know, to make large quilt is a commitment of time and money so I agreed with her, this would be a nice gift for him. If you remember from my last blog, I am not a fan of the tie fleece blankets, so I thought, why can’t we load the fleece fabric onto the longarm frame, with batting in-between the layers and quilt it, I think that would work and be a nice gift! 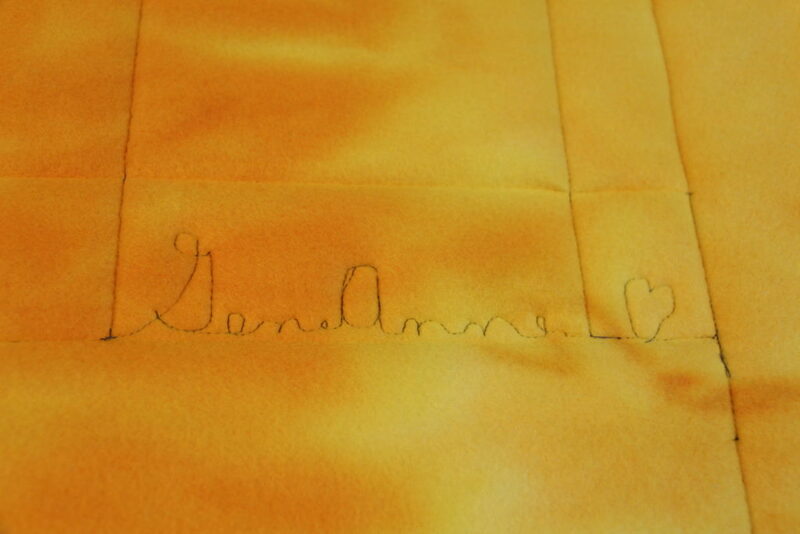 The stitching will keep it secure and the edges she could cut and have a fringe edging. I ran the idea past Gene Anne and she thought too, this would work! The first step in this process was to find fleece. He will be attending the University of Northern Iowa in Cedar Falls and their logo is the panthers. This seemed easy enough as she wanted the logo fabric on one side and a matching purple fleece on the other. Many colleges and sports teams offer their logo fabric, in store and online. 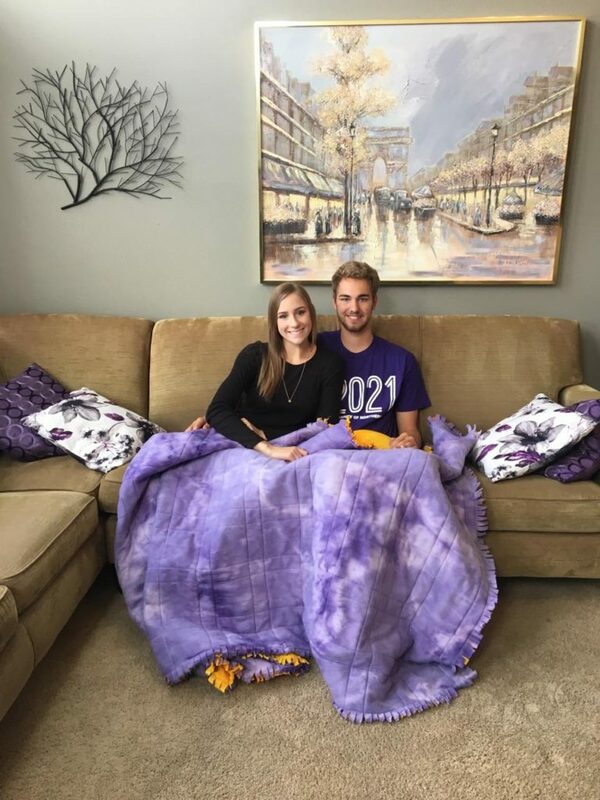 We were having much difficulty finding the UNI Panther fleece online and after a call to a local Joann’s fabric store I was told that UNI does not give out licensing for their logo and I will not find UNI fleece anywhere. She suggested a purple and gold plaid fleece with a solid backing. This was quite disheartening for Gene Anne but she was ok with looking for a plaid fleece to use. We checked out many sites online and she really did not find an option that would work, and if you buy fleece online, how can you tell if the front and the back will be in the same color family? About this time, we attended a graduation party in Mason City, Ia where a Joann’s was located. It was a huge store in my opinion with approximately 450 bolts of fleece,(I forgot to take a photo) I had no idea there were so many options, I was overwhelmed! So once again here, no purple and gold plaid. She decided on a faint tye-dye pattern of purple for one side and gold for the other. We purchased 2 – 96 inch cuts that are 60 inches wide, now I know most of you are asking, why would she need 8 feet of fleece? Well, can you guess why, this is a tall guy, about 6’5″. How many of you have experienced trying to cover up with a quilt that is too short, not fun! So she wanted to make sure this blanket was long enough. 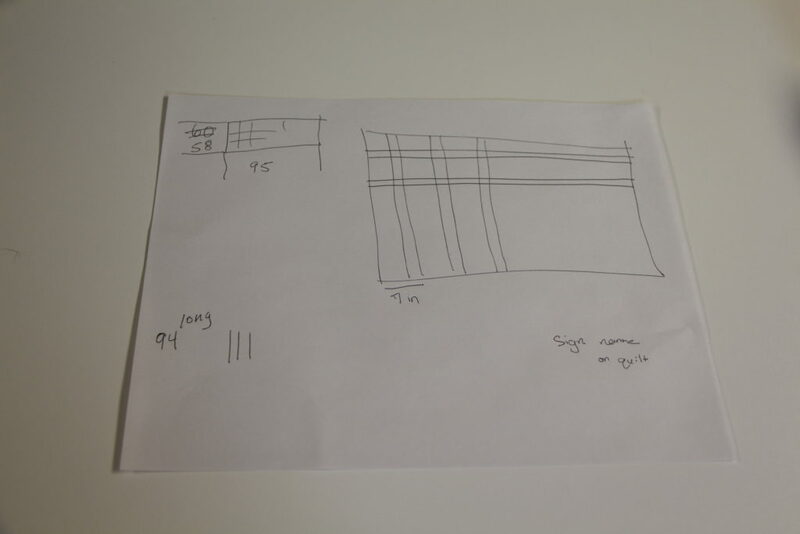 She quickly sketched out how she wanted the quilting pattern to be done, remember, she was looking for plaid fabric and since we could not find that, a plaid quilting design was a good option. Taking the dimensions of the blanket into consideration along with how far apart the lines should be, she came up with a plan for quilting. I know it probably just looks like chicken scratches to many of you, but it was enough to give her a visual plan. I helped Gene Anne load the quilt the long way as we quilters call it, doing it this way means you advance the quilt less, good time management. Next the batting was laid in place and then all 3 layers were secured across the top. 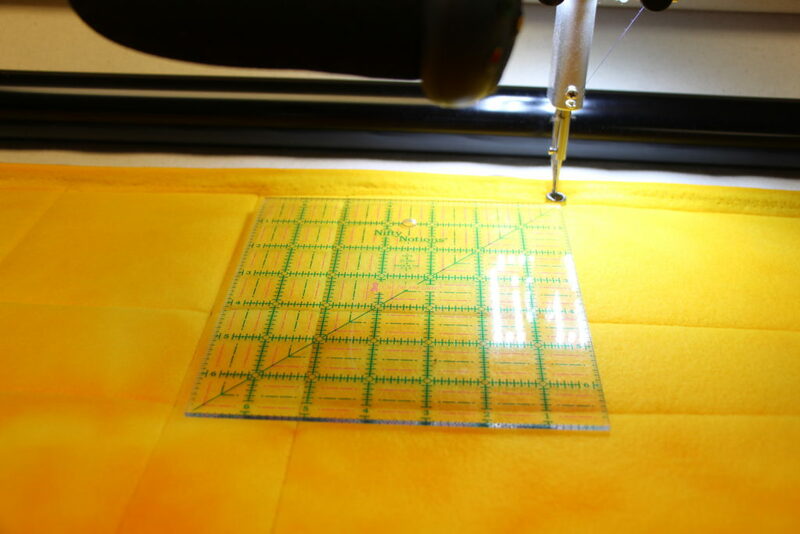 After this, using the horizontal channel on the longarm, she started with the lines that run parallel to the frame, for spacing she used a 7 inch square ruler as a guide, I think she did a 2 inch and a 5 inch spacing pattern for her desired quilting pattern. 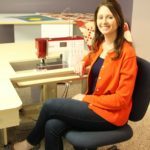 After this she used the vertical channel lock on the machine to complete the pattern. These simple options gives the quilter the ability to quilt perfectly straight lines, super easy! When an area was completed, she advanced the quilt to the next section. In the top photo you can see she is very pleased with how the blanket is turning out. As she neared the end she signed her name. With the quilting complete, I helped her take it off the frame, I was surprised at how heavy it had become with the batting in-between the layers! I guess that will be a good thing for the possible chilly college apartment Spencer may be in. As soon as it was off the frame she had to try it out, would it be cozy and comfortable? It would for sure be long enough for him. Next we trimmed the edges where needed to make it fairly even, if you remember from my last blog, fleece is forgiving, there will be no straight edge this one will have a fringed edge. For her last step, she is simply snipping the edge fleece that are about 1 1/2 inches into about 1 inch sections. She fluffed them as she went and it gave the fleece blanket a nice fringed edging. This quilted fleece blanket has since been gifted to Spencer and we feel he will get a lot of use out of it when he is at college. 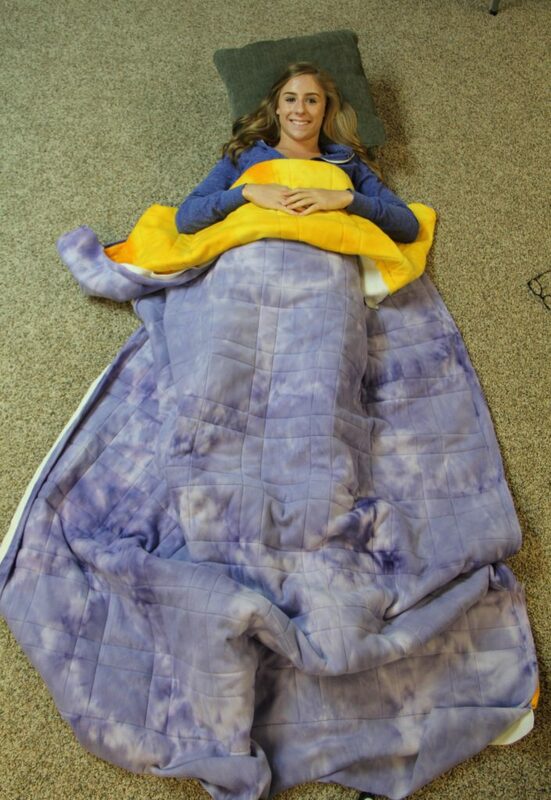 Tell me what you think about a quilted fleece blanket, has anyone else made one of these and how did it turn out? Happy Quilting! This entry was posted in Uncategorized on June 27, 2017 by Carla. Fun. Love the fringed edges vs tied. Great idea girls! I have made doll quilts with a fleece backing but did not put the batting in between. It worked great for a doll quilt! Love your quilt! It will be very warm! Cute couple!!! It will be perfect for the cold winters in Iowa, great job Gene Ann. I have put fleece on the back of my quilts because I wanted it soft and warm. My longarmer seems okay with fleece on the back and its wide so less seams on the back and its pretty affordable compared to cotton wide backs. I’m always grateful that I know so many really talented Longarmers who finish my quilts beautifully. Thanks for the post and I may have to try 2 layers of fleece. Love the plaid quilting!! I made a baby blanket with the left-over cuddle fabric from a baby quilt. Both sides were cuddle fabric, so I first sewed around the whole outside and pulled it right-side out, then sewed 1/2″ from the edge to secure it. I then put it on my LA and quilted a simple line-and-bubble design to hold the two layers together. Love how it turned out and my grandson loves it as well. I didn’t use batting because cuddle fabric doesn’t breathe and can get really warm…I think your quilt will be very warm and heavier than mine so it will also be perfect for those cold football games Spencer will be going to!! Gene Anne did a great job!